Plant Description: The carob is a dome-shaped evergreen tree that is a member of the pea family. It can reach over thirty feet or ten meters in height when fully grown. The compound leaves are dark green and the tree bears green flowers which blossom in the autumn. The fruit of the carob tree are called pods, brown in colour, and take a year to ripen. The carob has been used for human consumption and as animal feed in the Mediterranean countries for centuries. It is said that the pods of the carob tree sustained the biblical figure John the Baptist while he was praying in the desert. Hence the carob is also known as St. John’s bread. Because of the high pectin and tannin content of the carob pods it has been used as an herbal remedy for diarrhea. Pectin is a polysaccharide, a water-soluble substance, thought to aid in digestion and bacterial infections. The lignans, estrogen-like chemicals called phytoestrogens found in the plant, are thought to have antiviral, antifungal, antibacterial and anti-inflammatory properties. Those lignans could be helpful in the fight against some estrogen-related cancers, and they might be used as an estrogen replacement during and after menopause. Carob beans are popular substitute for cocoa. They contain fewer calories, are caffeine-free and non-addictive. Also they do not interfere with the body’s assimilation of calcium unlike cocoa and chocolate. 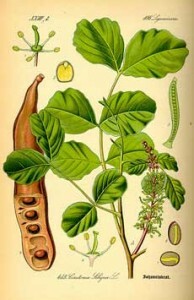 Carob can be taken as a tea, an extract or a capsule. When used as a remedy for diarrhea the usual dosage for adults is around 20 grams per day and children 15 grams per day. Carob should always be taken with plenty of water. Side Effects and Possible Interactions of CarobWhen carob is used as an herbal medicine it is usually considered a safe herb. There is a possibility for an allergic reaction to remedies made from carob but those are considered very rare and there are no known drug interactions.